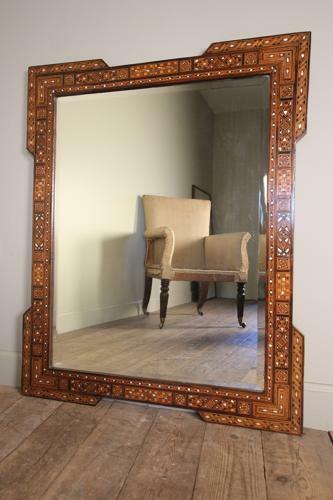 A beautiful Syrian wall mirror profusely inlaid in Ebony, Rosewood, Box Wood. Walnut and Mother of Pearl, retaining the original aged bevelled mirror plate. Super condition throughout. Syrian, Circa 1920. This mirror can be hanged both landscape or portrait and we can adjust the fixings to your requirements.